This article inspires, motivates, encourages and draws you closer to your success by discussing 55 simple tips on how to be successful in life. You can apply these tips to help you navigate the stormy oceans of life towards the island of success. Success is reaching a predetermined goal and accomplishing something that is of value or important to you or others which you had set out to do in the past. Success is the desire, aspiration and drive to do something meaningful, important, significant, valuable or substantial that has an impact on your life and other people. You are the only person who intimately knows what you want to accomplish in life and what kind of achievement will have the greatest meaning, fulfillment and impact in your life. Success is not easy. You already knew that, but what does it take to be successful in life? What does success mean? How can you be successful? How will you know when you become successful? 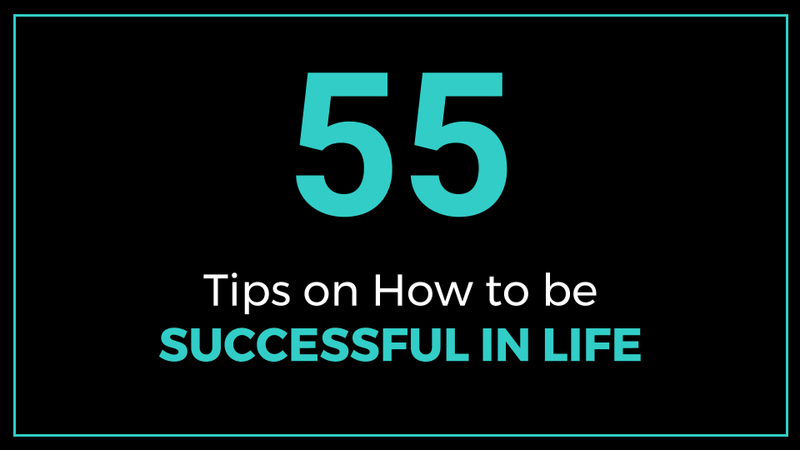 You can quickly skim all the 55 success tips on the table of contents below and then click on any tip to read further details. For your convenience, there is a summary at the beginning of each tip. Thank you, enjoy reading and I wish you success in everything that you do. The road to success begins by defining in your own terms what success looks like to you. Different people have different definitions of success. What success means to one person could be totally different from another person. The first step in your journey to success is to have your own clear definition of what success means to you. This is an exercise similar to determining your destination before you embark on your journey. Once you know your destination, there are many ways you can follow to get to your endpoint. Even when you get off track, it is easy to get back on the road. The most challenging thing is when you do not have a clear destination. In this case you would be wandering around without a clear objective or purpose. You have to fight for your success. It will not be handed to you. Prepare to go to the battlefield of success with a made up mind full of focus with images of winning the battle firmly imprinted on your mind. Your definition of success should be a source of motivation and energize you to get started and keep working on your success journey. To achieve great success in life you have to dream big. Your big dream should inspire you to take the necessary action to achieve the dream. How big are your dreams? What is the greatest thing that you want to achieve in your life? Challenge yourself to dream bigger. Decide that you want more fulfillment for yourself. Your dream is the destination of where you want to be in the future. When you are dreaming, do not worry about how you will achieve the dream, for now just focus on seeing the big dream in your mind as clearly as you can. The goal of dreaming big is to create a better life for yourself and others. Imagine endless possibilities for your life, your career, your family and the world. Visualize the outcomes that you want in your life. Zoom in on a few big ideas or one specific big idea that has the greatest meaning for you. By daring to dream big and going forward to reach for your dreams you in turn inspire others to dare to dream big and aim to attain the highest purpose of their life. Taking action is the most important step towards success. By taking action you get things done. The simple truth is that dreams, visions and goals are achieved and accomplished only through action. Taking the first step is usually the hardest part of the journey. Start at the level where you are then grow and increase your skill level and output over time. Action increases your confidence and leads to more action. Taking action gives birth to momentum. Simply put, by taking action you get things done. Action strengthens you. It grows you, makes you smarter, you learn more, you self-correct as you move along, you improve and become better. By taking action you get things done. However, it won’t be all smooth sailing, you will stumble and make missteps along the way but firmly picture the end result on your mind as you keep pushing forward and making focused progress towards your success. Little steps taken over time have the potential to make a difference. The small steps and actions add up over time. Are you feeling overwhelmed about starting? Don’t worry many people do. They feel fearful, confused, paralyzed, overwhelmed, anxious and apprehensive when it comes time to start. Do not be discouraged by how many times you have to start to gain your balance, once you gain your balance take a few easy steps and then a few more. You don’t have to do it all at once, this is a common misconception, you need to take one bite at a time. One positive aspect of starting small is you discover what works and what doesn’t. Perhaps you had assumptions that looked good in theory but when you applied them they did not work out as you had thought. This gives you an opportunity to evolve and discover new ways of achieving your objectives. Your plans and ideas could expand into ways and areas that you had not imagined before. You could gain more insights about the goal you are pursuing and you will learn more about yourself. Your level of confidence will also increase as you persist by moving forward. When starting small you can focus on every detail that needs your attention. You can also experiment and test new ideas. Starting small and taking small steps helps you to test the waters before diving in. The key to growth and progress is to do a bit more each new day than you did the previous day and make small improvements as you move along. The highest ideal as you pursue success is to aim to make a difference in both your life and in other people’s lives. There are two main ways to make a difference in life, one way is to make a difference in yourself and the second is to make a difference in others’ lives. Success stems from living a life where you truly gave it your all and worked on attaining the greatest good for yourself and other people. Making a difference in your life begins by taking an inventory of your current life situation. The inventory includes analyzing where you are emotionally, physically and mentally. Are you happy with where you are right now? Are you living your life to the fullest? Are you putting your skills, talents and abilities to the best possible use? It becomes significantly easier to help others and make a difference in their lives when we have taken care of our lives or are actively taking steps and action to be where we want to be in our lives. Add value in everything that you do. Think of how your dreams and ideas could help solve the problems of other people. Your solution could be your business opportunity that could make a difference in both your life and others. A clear vision points you towards where you want to be in life. Knowing your destination will keep you traveling on the right road even when you get off track. A critical ingredient for a strong vision is knowing what you are willing to do to achieve your vision and also knowing what you will not do. Both sides of the coin are equally important in determining how successful you will become. Clarity helps you eliminate those things and activities that don’t add value to your vision. Create a visual portfolio where you put images, photos, drawings, videos, quotes, newspaper clippings and other visual elements which show the kind of future that you desire. Your visual portfolio or vision board can be hard-copy or electronic. Take a photo of your vision board and you can even print a copy to keep in your purse or wallet. Your vision should be on your mind every day. Reflect and concentrate on the mental images as well as you sleep and over time you should be able to clearly see the image with your eyes closed. Perseverance is that inner drive that keeps you in the game when everything else says it’s time to quit. Get past limitations. Visualize the outcomes that you want in your life. Are you held back from dreaming big by thoughts such as you are not good enough or not capable enough? Get past limitations. Use words that empower and encourage you to emit success energy. Think long term; think about all the pieces of the puzzle that are needed to make your big idea work over time. Set ambitious goals for yourself. Ask yourself good thoughtful questions, analyze your assumptions, moves and choices then make strategic decisions. Imagine and anticipate. Look within yourself and also look outside yourself for sources of inspiration. Think about possibilities and go forward to reach for your dreams. Quality customer service is a critical ingredient for success both in life and at work. Be driven by a desire to give your best efforts at all times and in all that you do. Take time to listen to customers and be responsive to complaints. Desire to improve things and add value to everything that you do. One way to improve your performance and quality of service offered is by soliciting customer feedback on areas for improvement. Go the extra mile to ensure customers are happy. Build rapport and strong relationships with your customers and thank them for their business. Have a deep understanding of your responsibilities, products or services and be able to communicate the value offered and benefits to customers or other stakeholders. When you make mistakes, apologize and offer a timely solution. Above all, always maintain a good, friendly and pleasant attitude each time you interact with others. Get tired of a life of mediocrity and decide that you want to do better for yourself. Challenge the way things are now in your life. Are you just going with the flow, going through the motions or just surviving? If you are not dreaming big and imagining a big vision for your life take a moment to ask yourself what is holding you back from dreaming big? If you knew that you couldn’t fail at all what is the ultimate thing that you would aim to do in your life? What is your ultimate potential? How high you can go in life? Your dreams should not be limited by your circumstances, experiences, surroundings, fears or other people. Write down your dreams. Believe that your dream is achievable and identify steps to work towards achieving your big dream. A dream is like a seed planted on the ground that needs constant watering and nurturing so that it can grow. The bigger the dream the more exciting it is. You also work much harder to attain the dream and you grow as a person in the process. Spread your wings and go beyond the limits in your mind. At the same time keep in mind that achieving a big dream is not easy; it takes time, effort and great determination. Groundbreaking businesses have been formed as a result of someone getting fed up with how things are done and deciding to change things. Careers have also been transformed. Invest in building and improving yourself and your skills. For inspiration, read about others who have succeeded despite facing limitations, struggles and hardships. Learn about the strategies that others have used to overcome challenges and become successful in life. Ask others how they made it and ask for advice. Learn how they deal with doubt, fear, worry, uncertainty and failure. Implement what you learn to guide you in your path towards success. The knowledge that other people have been at the very same starting point that you are in and they took the plunge and dove into action should encourage you to take the first step. Taking the first step in your path towards success can be scary but it must be done. To achieve progress and success you have to take action. Motivate and encourage yourself by thinking about all the positive outcomes and possibilities that you want to accomplish. Avoid procrastination. It can hinder you from achieving your goals. I’ll do it later or I’ll do it tomorrow or I’ll do it one day – this is the simple definition of procrastination. You know what you need or want to do but you just don’t want to do it now. Why? Ask yourself why are you putting off tasks or making excuses for not doing them? To understand procrastination, the key diagnosis is to find out the root of the problem. Why don’t I want to do the task now? It could be because of fear, uncertainty or the task is difficult or unpleasant. It is easier to do tasks that are straightforward, pleasant and uncomplicated. On the other hand, tasks that lead to success require effort and are typically demanding, challenging and even complicated. In addition they take time to complete. Procrastination can also arise from uncertainty. Often times someone is not sure about the best direction to take to implement his or her dreams. Therefore, the temptation is to wait until the entire road map is available or the timing is perfect in order to begin. So it becomes a waiting game, waiting until all the pieces of the puzzle are available and make sense. Waiting for the right conditions and circumstances, waiting and breeding procrastination upon procrastination – a procrastination infestation, over analyzing and saying that I will do it one day. Despite our best intentions, there are those tasks that we keep postponing and serially postponing and they keep nagging us at the back of the mind. Overcome procrastination by listing your tasks or goals then prioritize your list. Roll up easy and simple tasks into one pile and do them all at once. Break down big tasks into smaller pieces and attack each small piece one at a time. Get into a comfortable working rhythm and momentum where you progressively move from one task to another, one at a time to completely finish all the tasks that you procrastinated on doing. Success entails not only working hard but also working smartly to achieve your desired goals faster. To be successful, you need to plan and prepare then put in the time and effort. For example when preparing for the Olympics, there is a lot of hard work behind the scenes, consisting of months and even years and years of training and practicing. It all begins by setting for yourself high standards of aspirations, excellence and achievement. Then utilize your skills, abilities and talents towards something specific that you are committed to doing. Working smart includes arming yourself with knowledge and information regarding your desired area of success. It includes learning about how others have succeeded rather than trying to reinvent the wheel. Find out which approaches worked and which ones didn’t. Find out which shortcuts, tips and tricks exist in completing a task satisfactorily. In addition, learn about systems, processes and steps that can get you closer to your desired objectives. Research and find out what you need to do to achieve your success. Aim to be the very best success that you possibly can be based on your success definition. Be the very best at what you do and know why you do what you do. Examples of success can include being the very best that you can be at an activity such as cooking, painting, gardening, singing, acting and starting a business. Others include teaching, swimming, writing, managing, leading, coding, designing, coaching, blogging, being a good provider for your family, making a difference in your community etc. Delay gratification. Practice patience. Enjoy the journey towards success. The desire for immediate gratification can be a barrier to success. Many people are addicted to wanting success here and now, not tomorrow or next week or even years from now. The desire for immediate gratification and shortcuts leads to temptation for shortcuts and get rich quick schemes. To be truly successful, patience and delayed gratification are necessary ingredients to put in your baking mixture. Success is like a cake it takes time to bake. Overnight stardom is rare. It takes time, heartaches and persistence to climb the ladder of success. Many good things go down first before they come up. A seed goes down before coming up. A tree’s roots go deep down for it to grow high. A building’s foundation goes down before the building goes up. A baby crawls before it walks. You go on probation when you start a job before you fully learn and master the job requirements, learn the company and start producing at full capacity. You write a draft of a piece of writing before you edit and polish it. There are no shortcuts to success, it takes time, energy, sacrifice, passionate desire to succeed and a strong will to win. There will be mistakes and failure along the way, mistakes and failures are the bridges you cross on your way towards success. Everything big that you see around you started small – a tree started from a seed, a building started from one brick – brick after brick, wood after wood and a house emerged. Be ready to work your way up. What you learn now helps you in the next step and the next. When starting the first step, take a leap of trust that things will work out and take the plunge. Don’t wait too long to take the plunge. Focus your energies on giving your very best at what you are currently doing and look for opportunities to increase your contribution. Your passion for life is found at the intersection of what you are good at doing, what you are most satisfied doing and what you would do for free. To earn a living from doing what you are passionate about is scoring a jackpot. The reality is that not many people are fortunate enough to work full time on a true passion that also provides enough income to pay all the bills. However, it is completely possible to work on loving what you do everyday. This love should be the driving force for the effort that you put in. The Merriam-Webster dictionary defines passion as a strong feeling of enthusiasm or excitement for something or about doing something. The next question is how do you find your positive passion? The emphasis here is on positive passions. How do you find out what you are passionate about? Sometimes your passion could be traced back to what you loved doing as a child. Look around to see who is doing what you love doing, who do you admire? Write down a list of things that you truly enjoy doing now and when you were a child. What do you like reading about a lot? What do you find yourself doing naturally often? What do you talk about often? What do you do most in your spare time? Look into the future; what would you want to be remembered for? What is your dream job? Instead of stopping everything that you are doing in pursuit of an elusive passion, focus your energies on giving your very best at what you are currently doing and look for opportunities to increase your contribution. You will be more in control when you have a strong track record of skills and abilities to pursue and achieve what you desire. Practice the habit of solving problems and brainstorming solutions for challenges that both you and other people encounter. Opportunities can be found in the midst of problems. Figure out a solution for each problem. Quantify or estimate how big the problem is, how many people are facing the same problem and what solutions you can come up with. Think about how you can commercialize your solution or turn your solution into a business opportunity. Explore how others have attempted to resolve or resolved similar problems. Is your solution better or superior? Do you need to tweak or further refine your solution? What additional problems can you solve? Ask people what problems they are facing. Moreover, what problems are you facing in your life? Life will throw you curve-balls. Expect the unexpected and react well. Don’t beat yourself up and also practice thinking on your feet. Learn from others. You don’t have to reinvent mistakes that others have already made – save time. Plan and prepare as best as you can for the future. There are endless possibilities in life. Imagination can be as big or as little as you want it to be. Where do you want to be in 5, 10, 20 or 30 years from now and most importantly, why? Everyone’s path to success is different. When you are pursuing your goals acknowledge that you might make mistakes and fail. Envisioning possible obstacles in your mind before they actually happen gives you an edge because should an actual problem occur, you will be more comfortable handling it. Practice the habit of offering genuine praise and appreciation to encourage others. The desire to be appreciated is a natural human desire. Acknowledging others when they perform an outstanding task or do a good deed helps to enrich interpersonal relationships. It also enables you to get along better with others. In addition, positive reinforcement raises people’s self-esteem and motivates them to repeat the positive behaviors that have been praised. When giving appreciation or gratitude point out the specific behavior, action or activity that you are acknowledging. Moreover, recognition, praise and acknowledgement is most effective when it is given in a timely manner. When given as close to the event or occurrence as possible. In order to get along with others smile, be friendly, be interesting, be genuine, listen keenly, thank and compliment others. Furthermore, demonstrate respect by remembering people’s names and use the names in conversations. Enthusiasm takes effort; you keep working at something over and over until you become good at it over time. Devote and invest time to work on and improve your enthusiasm. Maintain your excitement by thinking about your goals, believing in possibilities, visualizing your success, tracking your progress and being grateful about the good things that are happening in your life. Other ways of maintaining your enthusiasm levels entail listening to uplifting music or videos, hanging around other enthusiastic people and taking good care of yourself through nourishment, getting enough rest and sleep. Your energy level and enthusiasm can set you apart from others and give you an added advantage as you work towards your goals in life. Nurture your enthusiasm and use its power to propel you forward. Your hunger for success should make you push past your fears. Fear is a powerful force that holds back many dreams. It comes in many forms such as fear of failure, fear of ridicule, fear of the unknown etc. Fear stops someone from stepping out to stretch their potential and see how far they can fly. There are 2 things that can happen when you take action towards pursuing your success – you will either succeed or fail. One of the most common fears is the fear of failure also known as Atychiphobia. This fear can sometimes be so intense to the point of inaction; where no effort or action is taken because you are afraid of failing. First things first, no one likes to fail. Whenever we undertake to do something we always hope to succeed. The reality is that action is a two sided coin – success is on one side and failure is on the other. When you toss your “action coin” and it lands on failure, do not be discouraged. Evaluate why your coin landed on failure. What are the lessons to be learned? Try again, giving up is the path of least resistance, so don’t give up. Do what you love and do it to the very best of your ability. Keep trying and keep improving. Take consolation in the fact that many people who are successful today have failed at one point or another in life. There are few instant successes that made it on their first try. Failure is the bridge you cross on your way to success. Failing should strengthen your resolve and determination to move towards your goal. It also makes victory much sweeter after you accomplish it despite challenges and failures. Additionally, believe in yourself, change direction if needed but keep trying. Your hunger for success should make you push yourself harder. Believe that one day you will make it. Another thing to do is to clearly and specifically define what failure means to you. A good support system is also advantageous. Having someone you trust who encourages you and cheers you on can add motivation. The more you face your fears the less scary they become. Thinking differently challenges you to break your mental barriers and think beyond your limitations. To get an edge in life and really outpace your previous levels of success then there is need to do things differently. This implies moving away from what you have always done and exploring different ways of achieving your success. It also includes a change in mindset i.e. thinking in different ways. Doing things differently or thinking differently does not require you to make drastic changes overnight. Instead, it entails identifying an approach, idea or activity and then doing one small action at a time. Ways to think differently include challenging your own assumptions, challenging the conventional thinking, asking good questions, looking for unconventional solutions and being contrarian or going against the crowd. Other tactics include thinking outside the box, seeking better alternative options for how things are done, taking charge of your destiny, improving on what is currently available and taking it to the next level by making advancements. Thinking differently challenges you to break your mental barriers and think beyond your limitations. Imagine great possibilities. Trust your gut and intuition. Be innovative. Learn about different things and find a way to interconnect existing concepts processes. Begin by defining what your principles are in life coupled with what you want your highest achievement to be. Regularly brainstorm with others. Discussing ideas, suggestions and concepts in a group setting stimulates great creativity. This is even more powerful if members of the group are from different professional backgrounds and can inject new dimensions to the thought process. Resourcefulness is about making your time, money and other resources stretch or go the extra mile. How can you best utilize your time, money and other resources in an environment where you are faced with resource constraints? The Merriam Webster Dictionary defines resourceful as being able to deal well with new or difficult situations and to find solutions to problems. Trying to do everything by yourself can be challenging. One way to be more resourceful is through outsourcing and delegating work. Outsourcing and delegating help you to hand over tasks that consume a lot of your time. This frees up your time to focus on high priority or core tasks that can bring higher results and more impact. Be aware of your costs. Have a budget and track your expenses to get a good idea of where your money is going. Keep costs down by prioritizing expenses and also comparing prices prior to buying costly items. Negotiate for discounts and favorable prices. Barter or exchange your skills with others. Look for free training courses or tutorials online to learn new skills or polish up on your existing skills. Watch “how to” videos. Learn from others. Read, study, research and explore different topics and concepts. Time is another critical resource that is scarce. Prioritize your work carefully. Group similar tasks together and endeavor to complete them in one setting. Develop systems, tips, tricks and shortcuts for doing routine or repeatable activities. Reuse or recycle resources, concepts, ideas and methods. Reimagine things and processes. Identify tasks that will give you the highest return on the effort invested. Connect different things to produce something new or better improved. Other ways of being resourceful include renegotiating existing contracts to get better deals and taking advantage of free trials and coupons. When you feel uncomfortable, pace yourself and start small. Then gradually increase your capacity, tolerance and output. On your journey towards success, there would be moments where you will face challenges and experience discomfort along the way. There would be moments when you feel like the end goal is so far away or the process is difficult. You might face uncertainty and unknowns. Whereas we crave for certainty in our lives and predictability, these things are not guaranteed to us. You could be pushed out your comfort zone and feel overwhelmed when doing new things or facing a new situation or set of circumstances. All these scenarios are part of the process as you work towards your goals. The important thing to do is not to get overwhelmed by the big picture. Instead focus on adapting well and taking one small action at a time. Over time, practice, patience and perseverance will bring progress. Cherish the milestones and progress and keep reminding yourself of where you are going and why. On the other hand you could also face discomfort from within and without. You can be criticized, ridiculed or face rejection because of your dreams and goals. When criticized keep your eyes on the prize. While on your journey to success, you might feel a mixture of emotions that keep changing like waves in an ocean. One minute you could be feeling excited and optimistic. Whilst the next minute you could be feeling scared, afraid and unable to take action. Don’t worry; these cycles of discomfort are part of the success package. Acknowledge what you are feeling but don’t let it hold you back. Cultivate an inner circle of a few people that you deeply trust and can use them as a sounding board to boost, recharge and re-energize you during those moments or days when dark clouds are hanging all around. They should be able to encourage you to weather the thunderstorms and remind you that after the rain there will be sunshine and perhaps a rainbow to cheer you up. The unknown – is it as bad as we think? Is that fear talking? Have you ever done something you were fearful of doing then looking back you wonder … “Why was I scared?” Yet you did it. There is power in writing down your goal – it becomes a commitment to yourself. Most of the goals that people make are big and sometimes because of the size of the goal we might get overwhelmed about execution. One key strategy to do is to first identify and write down the SMART goal – specific, measurable, attainable, relevant, and time-based goals. If you want, you can also tell someone, who you trust, about your goal and they can hold you accountable as you work to achieve it. They can also check-in on you from time to time to see your progress and encourage you. The next step is to identify or determine a deadline for your goal, for example something that you want to achieve in one year. Next, break down the big goal into 12 months i.e. what do I have to do every month to get closer to the goal. Then break down the goal into weeks and then into days. You need to be able to answer the question – What is the one thing that I have to do every day or every week to get me one small step closer to my goal? Write down all the items above and start taking the baby steps every day. From time to time, read your big goal to remind yourself of your vision. Creativity includes looking for different ways to remix things, create a new path or improve an existing path. The power of creativity is a useful skill to harness as you work on your success. Creativity includes looking for different ways to remix things or create new things. It involves creating a new path or improving an existing path. Scare yourself with your imagination. Visualize new and bold things and ideas. Imagination can be either as limitless or as limited as you choose it to be. Whenever you are working on an activity, a process, or a system, constantly ask yourself how can I make it better? Tap into your different life experiences in life and try to connect different and unrelated concepts into one. There are many ways of stimulating creativity such as hanging around creative people, watching shows and videos, reading books, exercising, walking or spending quiet alone time. Creativity can be stimulated by playing, simply having fun or taking time out. It can also be brought out by going to or being in an environment that triggers your creativity. Creativity can be super-sized by working with others to creatively come up with concepts. You can exercise your creativity by merging new concepts with old ones, enrolling in competitions, writing a lot and attending shows such as fashion shows. Sources of creativity include talking to creative gurus, looking at clothes design catalogues, looking at interior design, building design and architecture magazines. Observe the creativity elements employed in flower arrangements, art, painting etc creativity in television commercials etc. The idea is to see the creativity in others and be inspired. Bottom line – Creativity is all around us. It adds beauty to life. Being observant entails being vigilant, attentive, sharp eyed and alert to watch and monitor trends, being up to date on issues and identifying opportunities. Improve your observation skills by paying attention to details. Pay attention to what is going on in your areas of interest. Being observant in this context entails being vigilant, attentive, sharp eyed and alert to watch and monitor trends, be up to date on issues and identifying opportunities. Observing helps to improve your people skills and interact well with others. Learn how to observe and interpret nonverbal communication or body language. Listen keenly to people’s opinions, feedback and perspectives to know how to respond appropriately. Being observant also includes looking within yourself or inwardly to know and understand moments when you get flashes of inspiration. Where do you get your aha moments? It could be in the bathroom, traveling in train, while taking a shower, while sleeping dreaming, while driving or even when working. A free flow of ideas can occur to you at any time or at any place. Sometimes your best ideas can occur to you when you are not doing any mental thinking or not working. The most challenging situation is when you get good ideas and inspiration when sleeping because of the risk of forgetting them when you wake up. Learn from your mistakes. Nothing good comes easy. There will be mistakes, failure, challenges and disappointments along the way. We all make mistakes. Learn from your mistakes and don’t be paralyzed by the fear of making a mistake to the point of inaction. Don’t beat yourself up for making a mistake. Nothing good comes easy. There will be mistakes, failure, challenges and disappointments along the way. There will be times when you will make the wrong turn or loose direction or momentum. Sometimes the strategies that you had thought would work might not work. Accept the failure in approach or strategy, learn from failures and mistakes and be flexible enough to change your strategies. Remember that you are only changing your strategy to accomplish the goal. The goal still remains the same. When you fall down, pick yourself up and keep going. There will be moments along the way when you feel like giving up or feel like not going on. There will also be moments of self-doubt, fear, anxiety and impatience. You might also face critics or even experts who discourage you and tell you that it can’t be done. Just persist during these moments. The journey to success is rarely a straight line; it is usually a zig-zag road with ups and downs. Keep track of your ideas by maintaining an idea journal where you write down your ideas. There is nothing as precious as your ideas. Ideas should be treasured, they are goldmines. One effective way of keeping track of your ideas is to maintain an idea journal where you write down your ideas. Start off by writing rough notes and rough drafts of the idea; it does not have to be refined or detailed. The first step is to capture an idea in its original and raw form, then let it ‘marinate’ both on your journal and in your mind. Then flesh out the idea as it becomes clearer and write it down in a structured way. Even if you will execute the idea 10 years from now, the objective is to document the idea now by writing it down so that you don’t forget it. One useful tip – always write down the date when the idea occurred to you. Keep a small journal where you jot down ideas, flashes of inspiration, light bulb moments and aha moments that occur to you from time to time. Later on review your journal and reflect on what you wrote – Are there any prototypes ideas? What idea can be improved upon? What idea can be scaled up and developed into a business plan, business opportunity, career opportunity, charity opportunity? Etc. Learn something new every day. As our knowledge and capabilities increase so does our potential and drive. Learn from other people. You don’t have to be the smartest person in the room. You will be surprised how much you can learn from others. Listen attentively, ask questions and ask for clarification. People are actually quite willing to share knowledge with others when they sense you are genuinely interested in learning from them. You also never know who would tell you the best idea that could change your life and make you successful. An idea could come from someone you least expect. It could even come from a child. Learn something new every day. Use your commuting time to listen to educational and inspiring material. Deliberately work on increasing your knowledge by reading books on various topics and disciplines. The more you read the more widely exposed you become. You get to see different perspectives. As our capabilities increase so does our potential and drive. It is difficult to achieve everything on your own. A team helps dreams and visions to be realized faster. Anytime a team is working together in a harmonious and coordinated effort, their combined output is significantly higher than the output of an individual working alone. This is evident in the office, in a business or in the community when teams work together on a project. Team members can also share work according to each person’s skills, expertise or capabilities. Brainstorming within a team can also be a powerful process that can transform abstract ideas to concrete and more polished ideas. Talking to a team or someone you trust about your ideas could help to further dramatically improve on your raw concepts. Regularly take time to think through and reflect on the goals you are aiming to accomplish. Set aside quiet time to think about your progress and what you want to accomplish in life. Thinking time should be a regular continuous habit; the good thing about thinking is that you can do it anywhere. The best ideas, insights and light bulb moments can occur during deep thinking episodes. Take time to think about where you have come from and where you are going in relation to your goals. Think about your dream and how you can improve upon it. Compete against your former self. Do things today that you couldn’t do in the past. Achieving one goal should be the starting line for another goal. Are you improving on a regular basis? Are you stagnating? Have you set up goals for your life? Are you achieving your goals or are you falling behind? What is your vision and outlook for the future? Are you optimistic about the future or are you fearful? If you are fearful, what are you afraid of? Why are you afraid? You’ve achieved your goals, what next? Achieving one goal should be the starting line for another goal. These are some questions to critically ask yourself to understand what improvements or changes you need to make in various areas of your life. Compete against your former self. Do things today that you couldn’t do in the past. Sharpen your focus increase your stamina and endurance. Increase your skill level and break your own records. Aim to keep getting better each day. Try out something that you haven’t done before. It could something as simple as trying out food that you have never eaten, going somewhere that you have never gone before, talking to someone new, changing your routine, trying a new hobby like painting, jogging, reading, listening to audiobooks, learning a new language etc. Learn from setbacks by analyzing what went wrong and reassessing your tactics. Key lessons to learn from handling setbacks include – challenges make you stronger and strengthen your ability to face and conquer more adversity in the future. You become more confident from overcoming many difficulties; you learn from mistakes by analyzing what went wrong and reassessing your tactics. When facing setbacks it makes you appreciate the good times; and you identify new ways to tackle tasks. Other lessons include – you accomplish more tasks with renewed wisdom; you also grow as a person – overcoming setbacks builds your resilience and strengthens your willpower. You become more focused in organizing and sequencing activities, and you become a visionary person who learns what works and what doesn’t. Self-confidence is a great ingredient for personal success. What is your confidence bank balance? For many people self-confidence is a constantly swinging pendulum that swings from one end to another. There are those moments when we feel confident and then there are those moments when we are not so confident, to the low points where we are not confident at all. It is important to note that a little fear and anxiety is ok, it keeps you sharp and focused. People respond to you based on how you see yourself, treat yourself and carry yourself. Project yourself as someone worthy and deserving of respect. We are not advocating for pride, arrogance or boastfulness. Project confidence through your mannerisms, attire, grooming, speech, walking with purpose, posture etc. By being open minded, you stand to increase your knowledge base and experience. There is usually a better way of doing things out there, or a better way of solving a problem, or a different way of looking at a situation or a challenge. The list is endless. When you allow yourself to listen to new ideas, opinions, thoughts etc. you are on the path to growing. You do not necessarily have to adopt everything that you come across rather you can absorb the new experiences and sieve out what you don’t like while absorbing the remainder which could be helpful to you. By being open minded, you stand to increase your knowledge base and experience. You are able to nurture your relationships and get along better with others. This in turns helps you in your social growth. Challenge yourself to look at the other side of the coin and see what possibilities lie there. Encourage pushback to get diverse opinions, ideas and different ways of looking at things to help in polishing and refining ideas. Endeavor to keep your promises. If adverse circumstances or delays arise, promptly give others a heads up. Start of by promising something small and give yourself more time to do the thing that you promised to do so that you do not get caught up by the deadline pressure and have to rush to quickly fulfill your promise or risk breaking your word and let it go or be tempted to conveniently forget to do what you had promised to do in the first place. In the workplace it will open doors for you to propel you towards higher responsibilities, recognition and even promotion. When you make a promise and due to overwhelming circumstances you are unable to make good on the promise, it is best to give a timely heads-up to alert the other person. Strike a good balance by taking care of your health, maintaining proper nutrition, resting and having a supportive network around you. To avoid getting overwhelmed by setbacks, it pays on a regular basis to take good care of your health. This contributes to your ability to persevere during stressful circumstances. Ask for help when you need it. Have a trusted confidant to talk to, open up, and share your feelings. Sometimes just talking through helps, it can also stimulate brainstorming for solutions and bouncing ideas around. Whenever you feel overwhelmed and anxious by how much work and time it will take to accomplish the big picture, take a moment to reflect on and appreciate the progress you have already made. Small wins here and there are to be cherished. Visualize how good it will feel to finally succeed and let these good feelings motivate you. At the end of it all, victory is sweeter after conquering challenges. Don’t compare yourself with other people. Everyone’s journey is different; instead be inspired by others. Persevere when you face critics and opposition. Being yourself begins by taking an inventory of your life so far; define to yourself who you are. The art of being yourself is continuously striving to be a better you today than you were yesterday. Who am I? That is a critical question that we have asked ourselves at some point in life. Finding your own voice and identity is easier said than done. The reality is that there is a lot of pressure in society to conform, fit in and blend with the crowd. It is easier not to rock the boat and there could be risks of being different. Conforming or going with the flow seems like the path of least resistance. However, do we really have to be like everyone else? One alternative is to study or observe behaviors and attitudes that we admire in others and mirror the desirable behaviors within ourselves. The art of being yourself is continuously striving to be a better you today than you were yesterday. It takes courage to be yourself and to be authentic. Being yourself begins by taking an inventory of your life so far, define to yourself who you are – how do you find yourself? What gives greatest meaning to my life? What do I want to accomplish in life and when? What have I failed at why? What can I learn from my mistakes? How can I improve myself? What inspires me? What makes me happy, sad or angry? What is holding me back in life? Why have I done things in the past the way I did them? What motivates me? Once you know and understand who you truly are, the benefits of your self-awareness include accepting yourself as you are, getting confident being in your own skin, not allowing others to define you, self-respect and self-reliance. Other benefits are knowing and acknowledging your shortcomings, realizing that you can’t please everyone, defining your life’s values and identifying habits that support your values. Making your own decisions, trusting your gut, believing that you can succeed in life based on your own definition of success and deciding to move out of your comfort zone. You don’t look outward for validation or affirmation, your moods are not controlled by others, and you don’t get hurt easily. You can offer more love, kindness and compassion to others. Offer more empathy and understanding. Care about yourself, groom yourself well, and eat well. Reprogram your mind as needed, let go of grudges, love and appreciate yourself better and flush out negative self-talk from your system. Consequently you can develop healthier relationships and friendships with people who accept you as you are with no pretenses and no masks. Self-doubt can be powerfully frightening. Self-doubt wants you to feel sorry for yourself and doubt your abilities to succeed. Self-doubt is that inner voice that kills dreams before they are born. Self-doubt is a cancer to progress. It causes many to quit prematurely when they face disappointments. Self-doubt can be powerfully frightening. You could have all plans well laid out, you are eager to make the first step towards doing something significant in your life then a drop of doubt starts dripping on your mind, it is followed by another drop then another and all of a sudden doubts are raining heavily in your mind. It becomes a thunderstorm complete with lightning and hailstorms. The doubts are busy telling you why your plan will not work out. You have no umbrella to shield yourself with and it feels like the flood of self-doubt is going to capsize you over and drown you. You try swimming frantically to save yourself but you feel too weak and overpowered, you just want to curl up in a corner and hide. When you feel overwhelmed like this you can overcome self-doubt through either the flight or fight response. Flight response: Just let go, relax, try to do something else and distract yourself from the doubts because the more you focus on your doubts the larger they appear to be like a piece of snowflake rolling down a mountain then it attaches itself to another piece of snow the another and soon there is a mighty avalanche roaring down the mountain. Fight response: Instead of dwelling on the worry and fear of why things won’t work, remind yourself and fill up your mind with all the reasons why it would work. It is war, valiantly battle with your self-doubts. Open the tap of your positive reasons and drown out all the negative why not’s. Fill up your gas tank until there is no more space for doubts. This takes time and practice, it doesn’t happen automatically. In reality, everyone goes through low points in life and periods of doubts. Keep planting positive seeds in your mind and uprooting the negativity weeds. Remember that maintaining positive thoughts and attitudes is continuous work. Just keep working on it one day at a time. Be polite and well-mannered in your dealings with others. Practice common courtesy – say it and mean it when you say please, thank you, excuse me and I’m sorry. Walk away from gossip, respect other people’s time, avoid never ending complaints, be happy for others, respect the opinions of others and give others your full attention when they are talking to you. Admittedly it is not always easy to apologize and to say “I am sorry” or “I apologize”. This could be because of reasons such as ego, pride, status, position or any other reasons. When others wrong us we expect them to apologize promptly to us yet when we wrong others why are we not so quick to admit our errors and apologize? Learn from others about how they have achieved success in their lives. Draw inspiration from them. A common desire among many people is to take the level of their proficiency, skills and abilities to a higher level. An individualized and customized coaching or mentorship program may be out of the reach for many due to the cost. However, due to the Internet, you can find coaches who offer free training and step by step programs such as on YouTube videos. Motivate yourself by seeking inspiration from other people who had visions for their life and worked towards successfully achieving their vision. Talk to others who have accomplished what you are trying to achieve. Learn their stories of success, failures, hardships, perseverance, motivation etc. Ask them how they made it through. Seek advice. Seek inspiration. In addition, read about others who have overcome adversity and succeeded. Read inspiring quotes and watch inspiring videos. Help others as well who are facing the challenges that you have overcome. Today’s success can be the recipe for tomorrow’s failure. Sometimes big failure comes after big success. Don’t let your guard down. Today’s success can be the recipe for tomorrow’s failure. Sometimes big failure comes after big success, why? You become comfortable, you let your guard down, you become entitled, you feel like you are invincible and take things for granted. After success you can rest a little but then get back up and push forward harder than before. Each time you succeed your endurance muscles increase but you have to keep your muscles active and keep moving with the momentum. It is always hard to start from a standstill position. Even a car takes time to move from standstill to pick up speed, same for an airplane but once speed has been picked up it becomes easier to shift gears and move further faster. Release the brakes of complacency and keep doing what you need to be doing to succeed. Do not give up when the skies are cloudy, do not give up when it is raining and muddy, and do not give up when it is dark and scary. We all know that life is not a bed of roses. Life has struggles, challenges, and ups and downs. When we make plans they might not always go like we want them to. When we set out to do something we might not always succeed. When we count on someone they might let us down. Each time we do or try something and we don’t succeed, be persistent, keep on trying, we grow through challenges, and always remember that life has struggles but do not give up. Sometimes things could be hairy and it feels like nothing is working your way, every direction you turn to there are roadblocks and obstacles and there is no magic fairy to come to your rescue. Each time you try and fail, learn from your failure and mistakes. Critically reflect on and analyze where you went wrong and use this knowledge and insight to keep improving as you move forward and onward. Connect with others who are working towards similar goals as yourself and encourage each other. One way to inspire yourself so that you don’t give up working towards your success is by seeking out and surrounding yourself with other people who are working towards similar goals as yourself. Talk to them, learn their stories, learn their struggles, and tell them your story – if you want to. These days you don’t even have to meet physically; you could join an offline or online group of like-minded people in social media and identify a group or a forum for people with similar goals as yourself and encourage one another. You will likely find out that other people are facing more or less the same challenges that you are facing. You might even end up being the one who is actually encouraging others. By helping others we also help ourselves. The challenge with watching TV is that it eats up time, time that would otherwise have been spent doing something else to get you closer to your life goals. The ideal suggestion would be to completely turn off your television, however this is impractical for most people therefore the next best thing is to drastically reduce the amount of time that you watch television by 80%. If on a typical weekday you watch TV for 5 hours in the evening then reduce that to one hour per night. This frees up an extra 4 hours per weeknight which can be channeled towards productive activities such as reading, writing a business plan, writing your ideas, listening to a talk, try cooking a recipe, read motivational quotes or meditate. It is not easy to pull oneself from the habit of watching TV everyday but with determination and practice it can be done. One key solution is to identify an alternative activity that you can do instead of watching TV such as cooking a new recipe, reading a book, playing with kids, listening to an audio book, writing, reviewing your goals and noting progress and areas for improvement, talking with loved ones, drawing, painting, exercising etc. Slowly cut back the number of hours that you watch TV every day. Let this become your new goal – for example if you usually watch 5 hours of TV per day, your goal for month one can be to cut back by one hour everyday; then the goal for month two is to cut back by one more hour until you reach your target. On the other hand, if you are strong willed person you can make a decision to immediately cut back on watching TV by 80%, so if you typically watch 5 hours of TV per day you will now only watch 1 hour of TV per day. You will now have saved 4 hours per day which you can invest in activities that will improve your physical, mental and emotional well-being. When receiving feedback, remember to thank the person who took time to give you feedback. Feedback needs to be timely to be effective. The risk of waiting too long to give feedback is that it negates the usefulness and relevance of the feedback. In addition, we are more receptive and able to learn and retain more immediately after a specific event or activity has occurred. For feedback to be beneficial it needs to be specific and not general or vague in nature. Similar to how we appreciate receiving feedback from others, it is important to also reciprocate by giving feedback to other people . Give feedback feedback in a respectful manner. Identify the specific behaviors and how improvements can be made, not an attack on the person. Also sugar coating the feedback makes it loose it’s corrective ability. Find a good balance between being direct and being respectful. Allow room for the receiver to ask follow up questions. A good habit to cultivate is to proactively ask for feedback often so that you can use it to improve yourself. Imagine yourself as succeeding. Cultivate an attitude of expecting success and believe that you will succeed. The success process is covered in ups and downs, highs and lows, nevertheless, enjoy the process of working towards being successful. Imagine yourself as succeeding, cultivate an attitude of expecting success, believe, persevere, keep trying, learn as much as you can about the endeavor you are pursuing, have a willingness to stick your neck out and risk failure to try to succeed. Success is not a one-off or overnight activity or event; rather it is a continuous process where the goal is to always keep getting better each day. Having a picture in your mind of the finish line or a vision of what you want to achieve will keep you hanging in there and trying until you make it. See the destination in your mind’s eye then work towards getting there. There is something powerful about seeing how the end goal looks like. Connect with your goals and let them excite you. Cultivate a continuous attitude of gratitude. One way to ensure that you don’t give up despite life’s struggles is to always find something to be grateful for. An attitude of gratitude goes a long way in improving your outlook in life. Take time to reflect on all that you are thankful for such as being thankful for a job, thankful for the gift of life, thankful for every new day, and thankful for our families and friends who have supported us and stood by our side. Help others whenever you can. Strive to be of support and assistance to others. We all have a responsibility to make the world a better place in whatever way we can. Your contribution could be big or small but it still counts. One person can make a difference in the world. You can inspire yourself, you can inspire others, you can encourage yourself, and you can encourage others. Help others whenever you can without expecting anything in return. Aim for the betterment of others, strive to be of support and help to others. Serve others. Open a door for someone, introduce someone to a hiring manager, introduce someone to a date – help someone to find love. Always strive to be kind. Keep planting these good seeds. We’ve all been helped by someone at one point or another in our lives. Pay it forward. Return favors whenever you can. Give credit to others. Share information – everyone knows something. Talk or call a friend. Praise people behind their backs. Get along better with others. Celebrate other’s success, being happy for others good fortune. Be interesting, listen keenly and offer kind compliments to others. Be reliable, dependable, have others back. Support a charity. Give money to a cause you care about. Be generous – generosity doesn’t have to be just about money there are many ways numerous ways that you can be generous such as volunteering your time, offering to help someone who is need, introducing someone to your contacts who can help or open doors for the person, even cooking for someone . Share your gifts, talents, skills, abilities, knowledge, train someone, develop a template, develop a set of processes or procedures that others can use, develop a checklist, develop guidelines, reference manuals, write a blog, write an eBook, prepare a how to video, do a talk, podcast etc. Slow down and zig zag every so often. Do not be so busy that life passes you by. Make memories, enjoy life and have fun. Life should not be an endless stream of busyness, rushing from one thing to another. Every so often slow down and take time out to enjoy life. Enjoy the sights, cherish the scenery, break your routine, go to unfamiliar places, do different things, sit back, hang out with family, friends, go for happy hour with colleagues, celebrate someone’s birthday. Attend a baby shower or a graduation, go watch a game, swim, jog, take a long walk, go to a park, watch a movie, dance, play chess, scrabble, play with your kids, try cooking a new recipe, laugh. Do karaoke, do a barbecue, go to a zoo, visit neighbors, family, friends, relatives, take a vacation, watch sunrise or sunset, take photos, visit you favorite social media platform, invite friends over, volunteer, do some gardening, clean your house, sit still or meditate. Do not be so busy that life passes you by. Make memories, enjoy life and have fun. Dressing for success is very important for the ambitious career conscious individual. Below are three tips that you can add to your arsenal of dressing for success to help you as you navigate upwards in your career. One – Dress one or two jobs up and at the same time represent your current job with pride, style and elegance. Dress for the highest job that you aspire to be in. You don’t necessarily have to buy outrageously expensive clothing. Spend wisely and be frugal as you choose high quality affordable items that have a polished look and feel. Two – Good grooming is paramount. This entails taking care of the little things – using deodorant; hair well cut, well styled and combed or brushed; fingernails trimmed, neat and tidy; shoes well-polished and sparkling; wear clean clothes and don’t forget to invest in a nice belt, power tie and scarf. Three – When you are in doubt about the appropriateness of wearing a piece of clothing, listen to your gut and skip that item of clothing. Remember that when you look good, you feel good and when you dress professionally you are viewed more favorably and taken more seriously by others. Connecting the dots helps in identifying small details or dots and how they relate to the big picture and also equally you can see the big picture and break it down into its constituent small parts. Life is moving at an incredible speed and currently we have access to more information than ever before. Sometimes processing all the information that we receive can be overwhelming yet we need to be able to discern, sift through, identify and make sense of what information we need to guide our decision making. It is very important to develop an eye for recognizing patterns, trends and connecting the dots for seemingly unrelated ideas, events, experiences and things. The ability to “Connect the Dots” is one skill that is important to add to your armory. Being able to connect the dots gives you a strategic advantage because you will be able to see the small details or dots and how they relate to the big picture and also equally you can see the big picture and break it down into its constituent small parts. Connecting the dots is both a backward looking and forward looking process which helps in developing and sharpening vision, forward thinking, creativity, innovation, decision making and being proactive which are all hallmarks of great leaders whom we respect. You can practice connecting the dots by perfecting your observation skills, listening keenly and attentively. Listen to what is being said and what is not being said, watch nonverbal communication with great interest, be curious, ask questions, explore different things, take good notes, consume lots of interesting information, read widely and often, network, and collaborate and brainstorm with others. On a frequent basis, spend time thinking and reflecting on information that you have acquired and connect this new information with all the other memories, surveillance, intelligence and past experiences that you have gathered throughout your life. Analyze information and experiences to find the dots and how they are connected in the great jigsaw puzzle called life. It is important to note that whereas it might be easy or fairly easy to see the connections between some dots, for other dots it can take a long time to see the connection or cause and effect relationships and sometimes there isn’t any connection at all. Just keep your antenna up and keep repeating the “connecting the dots” process. Have faith, strong belief and combine this with action. Uncertainty is your friend; it keeps you believing, exploring, learning, growing and searching for possibilities or dots. Manage your money by living below your means. A discussion on success and pursuing your big dreams would not be complete without talking about money. Have you ever analyzed where you spend your paycheck? Most people have monthly budgets that they maintain to plan their monthly spending. It is possible that sometimes the actual monthly expenses do not exactly match the budget – so where does the money go? On any particular month, consistently track each and every expense for a whole month then compare actual expenses against your monthly budget. This can be a useful eye opening experience to truly see where your paycheck goes. One good way to manage your money well is through having a budget. Other ways include keeping your expenses as low as possible, using shopping lists, developing a savings plan, managing credit card usage, retirement planning, reducing debt and investing. Initiate automatic transfer of savings. Gradually increase your savings and investment percentages over time. Have a shopping list and stick to it. Look for bargains and discounts whenever they are available. Look for common ways to save such as bulk shopping and eating out less. Don’t compare yourself with others – the joneses etc. Check and monitor your credit report regularly. Measure your progress towards success on a regular basis. Track the milestones that you have achieved. Evaluate your performance regularly and remember to reward yourself or celebrate once you reach specific measurable milestones that you have set for yourself along the way. Just like when you set out on a road trip you need to chart out in your mind a mental map of where you are going and how you will get there, similarly in life we need to have a mental map of what we want to achieve and accomplish for both our personal and professional lives. At specific intervals on your journey to success, assess the location where you are in relation to your desired destination. How close or far are you from the destination? How much distance have you traveled so far? Are you on the right road? Are you moving at the speed you had anticipated? Do you need to make any adjustments? Have you encountered any roadblocks? How can you avoid obstacles on your path going forward? At regular intervals ask yourself deep questions including what have I done so far, what did I want to accomplish, did I get it done, if not why not? Always refer back to your vision as a guidepost. A written down, clear vision or goal helps you to be organized and it helps in aligning your short term-term and long term goals and activities. What you want to achieve should be very clear in your mind as you figure out a way to get you from here to there. You will be able to identify things that do not fit within your vision and eliminate those from your life. You will be more focused and more productive because you know what you are going for and you are working step by step towards achieving it. This detailed article inspires and motivates you to achieve success by walking you through tips on how to be successful in life. Success tips include taking action, starting small, visualizing, being determined, practicing possibility thinking, being resourceful, surpassing your former self, setting goals and tracking progress.